... was a project title employed by EYE to showcase primarily instrumental Dark Electronica Music - some called it "stoner acid house" - that was made in the mid-90s with an emphasis on using Analogue Synthesizers - such as the Roland hardware units called TB303, Juno 6, Juno 106, TR808 & TR707 - amongst a range of digital MIDI units. See below for some brief info and links to AYA music - explore the other project links to learn more. 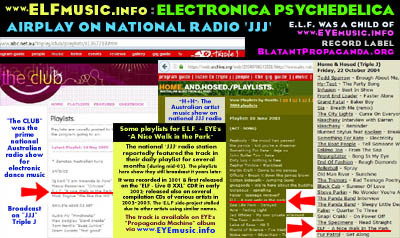 The AYA project - or variations of - were featured via numerous: radio shows; major media publications; compilation CD albums; albums released by small labels in the USA and Europe; and live performance events including at the popular Sydney Big Day Out music festival as part of the Clan Analogue stage - this link opens a poster about that. This page has a list of "AYA" appearances on various artist compilation albums among more instances as EYE, ELF and E.L.F. 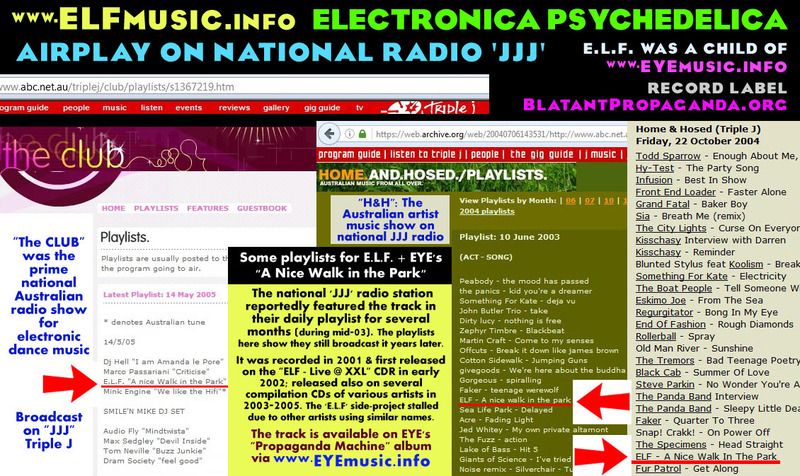 These live performances by EYE members were done under a variety of project titles like: 'Aphazia', 'Clanberra', 'Stoat', then 'AYA' for a few years & then eventually settled around 1999 on being known as ELF and E.L.F. .
As E.L.F. the music was performed live numerous times - including tracks made during the time of "AYA" - with songs broadcast numerous times on radio - most notably on one of the most popular radio stations in Australia, the national Triple J (JJJ) network. This version of the track "Rituals" was recorded in 1996. It was originally titled "The Bions". This is the original "analogue" version with a prominent (and real) Roland TB303 synth box doing acid bass lines while synced to a Juno 6 which makes a variety of rhythm motifs; amongst a variety of digital synths. 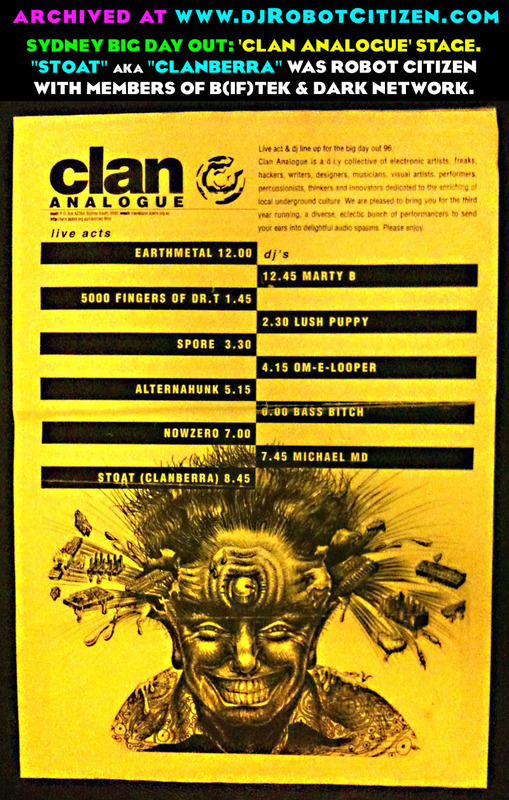 This music piece was inspired by performing live at the 1996 Sydney Big Day Out as part of Clan Analogue Canberra's one-off super-group ;-) that was called both "Clanberra" and "Stoat". Later versions of this music piece - regularly performed live under the artist title "ELF" or "E.L.F." - employed a digital Korg Prophecy synth to produce those bass lines. You can hear a 2002 live recording of that version here on EYE's youtube channel. Another example of what early "AYA" sounded like care of the AYA music bandcamp page. This track was recorded in early 1996; inspired by the live performance as part of "CLANBERRA" (Clan Analogue Canberra) at the Big Day Out music festival in Sydney. This is similar in style to the music that one-off collective made. The track is based around a TB-303 bass synthesiser and drones from a variety of other units. The track was released on CDr and cassette-tape albums in Australia, UK/Europe & USA under the title "Erleuchtung" which translates from the German to "Enlightenment" ;-)... "SleepyKundalini" was the original working title & makes better sense.